Do you see this crappily-staged photo of our box? Did you notice I haven't been posting about the CSA? I know it's too early to write a review, but clearly, I'm not going to post about my CSA boxed share anymore, so now is as good of a time as any. When we started, I was very excited about being in a CSA. I had talked about joining one for a long time, searched through all the farms in our area, and was happy to find one that sounded good (despite not great Yelp reviews) and that was both organic and vegan-friendly. After taking the tour, I was excited at the prospect of not only the fruit and veggies it appeared we were getting, but by the idea of helping support a farmer. No farms, no food, right? 1. Both Chesterfield and Pennington are about an hour away. Had they been more transparent about the differences between the farms (i.e. Chesterfield gets figs, Pennington does not, etc.) I would have joined Chesterfield instead since you seem to get a larger variety of items from there. 2. Chesterfield's season started sooner, due to weather issues which I understood. But then they were going to allow on-farm pickup people to start PYO at Pennington earlier than the off-site, boxed share people...how is that fair? I think if people hadn't started emailing about it, the boxed share people would have gotten a week or two less produce than the on-farm pickup people. They don't seem to understand that they should treat all CSA members equally. 4. People picking up at the farm seemed to pay less, yet get more produce as well as more of a variety of produce. By my perception from when we were there and there were a lot of on-farm pick up people picking up their shares. I don't know that for a fact. 5. The amount of greens I got was unmanageable for us, and unless I remembered to freeze it, a lot went to waste. 6. They started having some man sell honey and beeswax products at the farm. I know people are all like yay honey! But honey doesn't have the beneficial properties it used to. It did when it was seasonal and the bees weren't being fed fast food (aka sugar water). Sorry, but I'm not interested in animal agriculture of any kind. 7. Not a direct issue with the farm, but someone from my pick up location was rifling through the boxes and either swapping stuff or outright taking things. So I had to switch from going after work to going on my lunch break which was very annoying. 8. It didn't feel like a community coming together as much as I'm a customer who didn't really matter to such a large scale CSA. I think they cater more to their local community, which is a more high-end crowd, who I'm sure care more concerned with telling their friends they're in a CSA than they actually care about how the CSA is run. I could be totally off about that, but based on some of the people on the tour, and the kinds of cars in the parking lot...I don't think I'm totally off base. It wasn't the right CSA for me, but maybe it is for you. 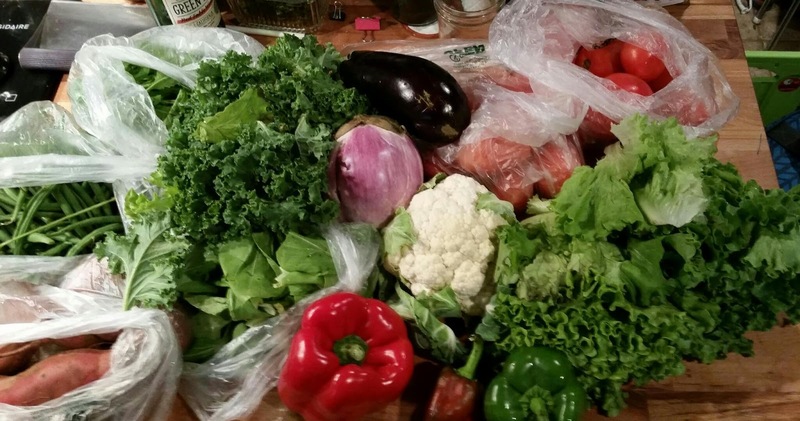 If you live close to the farm and can get your CSA pickups from there and do the PYO during the week, then you are definitely going to get more bang for your buck than I did. The produce was really good, fresh and crisp. I enjoyed the newsletters. The corn was phenomenal. There was also a convenience factor to picking up a box of veggies without having to go search around the grocery store trying to figure out what was fresh that week. Since the items weren't necessarily things I would buy on a regular basis, I had to think outside the box in using everything up. Follow me on Instagram if you want to see what I've made. I am on the fence about taking part in a CSA next year. We did find some really great farmers markets near us. Well, actually the ones near us, like Rutgers, does it during the week during work hours...perhaps they also want to cater to higher-income folks that don't work, who knows. I mean, why make organic, locally grown produce easily accessible to middle and lower-middle-class folks...but that's a different discussion for another time. But further away from us, there are great ones, selling produce from local, organic farms on the weekends. We were thinking about going to a farmer's market on the weekend, put aside the same amount we were spending to be part of this CSA and buy our own produce. Let's see if that works out better or not. If not, then I'll try to find a CSA. I'm not disappointed that we joined this CSA. It was an interesting experience, and I am still very pro-CSAs. I would recommend that everyone look into CSAs in their area. Try it out for a season and see what you think. All these vegetables look so great and fresh. I think the vegetable and fruits that we take from the farmers are the best options for us as they have the fresh ones. The DMSO and other nutrients in ArcticBlast demonstrated to work in clinical studies with the highest level of proof.